John Trinder is a BSurv and PhD graduate of the University of New South Wales (UNSW) in Sydney Australia and also gained an MSc degree at ITC in The Netherlands. He has worked at the University of NSW since 1965, progressing to the position of Professor in 1991 and Head of the School in the School of Geomatic Engineering, now School of Surveying and SIS. He is currently Emeritus Professor at UNSW. John has undertaken teaching and research at UNSW for about 40 years, specializing in Photogrammetry and Remote Sensing, and has published more than 150 scientific papers in journals and conference proceedings. He has held a number of positions in the Council of the International Society for Photogrammetry and Remote Sensing (ISPRS), including Treasurer from 1992-1996, Secretary General from 1996-2000, President from 2000-2004, and First Vice President 2004-2008. Dr M. Hernandez is Mexican and has a PhD in Remote Sensing. He started his professional work with the IBM Scientific Center for Latin America, located in Mexico City. His research work at IBM was to further develop image processing software for satellite data. Within IBM Dr. M. Hernandez moved to work at several IBM research centers, among these Palo Alto (USA), Brasilia (Brazil), Vimercate (Italy) and Paris (France). Later on he moved to work on applied satellite remote sensing projects within the United Nations Environment Programme (UNEP) managing the Global Resource Information Database (UNEP/GRID) and assisting developing in the use of Remote Sensing and Cartography to prepare their State of the Environment reporting. In 2000 he moved to the United Nations Educational and Cultural Organization (UNESCO) where his job was to initiate a network of space partners assisting UNESCO with the documentation, presentation and preservation of the famous World Heritage sites. Within UNESCO Dr. M. Hernandez was able to establish the largest space network assisting the UN: over sixty space partners became members of the European Space Agency – UNESCO Open Initiative on the use of space technologies to assist World Heritage sites. Dr. M. Hernandez work has been focusing in assisting developing countries in having access to new technologies and benefiting from remote sensing and photogrammetry. Currently Dr. M. Hernandez is a special consultant for the United Nations Educational and Cultural Organization (UNESCO), he is the Regional Representative for Latin America of ISPRS (the International Society for Photogrammetry and Remote Sensing), visiting Professor of the Chinese Academy of Sciences at RADI (the Institute for Remote Sensing and Digital Earth) as well as Dr. M. Hernandez is a member of the Council of the International Society for Digital Earth. Dr. Marguerite Madden is the Director of the Center for Remote Sensing and Mapping Science (CRMS) and Professor in the Department of Geography at the University of Georgia (UGA). She received her B.A. (1979) and M.A. (1984) degrees in Biology from the State University of New York at Plattsburgh and her Ph.D. (1990) in Ecology from The University of Georgia. Her research over the past 27 years at UGA has focused on geographic information science (GIScience) and landscape analysis of vegetation, landscape-level human impacts on natural environments, and more recently, collaborative research in animal behavior, wildlife disease, human geography and environmental design. Dr. Madden is a Past President and Fellow of the American Society for Photogrammetry and Remote Sensing (ASPRS), Editor of the 2009 ASPRS Manual of GIS and current International Society for Photogrammetry and Remote Sensing (ISPRS) Technical Commission President of Commission IV "Geodatabases and Digital Mapping". She has three grown children and lives in Athens, Georgia with four dogs, three cats and numerous bicycles. Lawrie Jordan is Director of Imagery for Esri, as well as Special Assistant to Jack Dangermond, President of Esri. In this capacity, he serves as an advocate for successful applications of all forms of imagery within the GIS enterprise, including environmental, civil, defense and intelligence community solutions. Mr. Jordan has over 30 years of experience as a leader in the field of image processing and remote sensing, including a long standing strategic partnership with Esri. He has been an advisor to numerous government organizations on current and future trends involving imagery and satellite programs. His background education is in Landscape Architecture, with degrees from The University of Georgia and Harvard University. Prof. Dr. Deren Li, scientist in photogrammetry and remote sensing, dual membership of both the Chinese Academy of Sciences and the Chinese Academy of Engineering, member of the Euro-Asia International Academy of Science, the honorary doctorate of ETH. At present, he is Professor and PhD supervisor of Wuhan University, Vice-President of the Chinese Society of Geodesy, Photogrmmetry and Cartography, Vice-president of Hubei Association for Science and Technology (HAST), Chair of the Academic Committee of Wuhan University and the State Key Laboratory of Information Engineering in Surveying, Mapping and Remote Sensing. In the 1980s, Prof. Deren Li was mainly engaged in the studies of observation errors and processing methods in geodesy and photogrammetry. In 1985, he completed theoretical research in the separability of model errors, which advanced the reliability theory to the separability phase. The result of this study received the 1988 Best Paper Award of the German Society of Photogrammetry and Remote Sensing, and Hansa Luftbild Award. From 1990 up to now Prof. Deren Li has concentrated on the research and education in geo-spatial information science and technology represented by remote sensing (RS), global positioning system (GPS) and geographic information systems (GIS). Lewis is the President and Chief Technical Officer of GeoCue Corporation, a company whose focus is geospatial workflow management, particularly for LIDAR data processing. He is also the managing director of QCoherent Software LLC (a GeoCue company), a company that builds LIDAR data processing tools for the ArcGIS environment. Prior to founding GeoCue, Lewis was the founding CEO of Z/I Imaging Corporation, a joint venture company of Carl Zeiss and Intergraph Corporation. Prior to Z/I, Lewis was an Executive Vice President at Intergraph, managing the Mapping and Civil Engineering business units. Prior to Intergraph, Lewis was an officer in the US Navy where he taught physics at Naval Nuclear Power School. He is an active member of the American Society for Photogrammetry and Remote Sensing (ASPRS) where he currently serves as a director of the board and as the director of the LIDAR Division, the division responsible for airborne and mobile LIDAR. He has chaired the LAS data standard committee since its inception. He a member of the ASTM E57 data standards committee where his focus is assisting with harmonizing the data standards between E57 and LAS. Lewis is also a member of the Transportation Research Board and currently serves as a panel member of National Cooperative Highway Research Program (NCHRP) 15-44 which is developing standards for mobile LIDAR scanning for transportation. Christian Heipke is a professor of photogrammetry and remote sensing at Leibniz Universität Hannover, where he currently leads a group of about 25 researchers. His professional interests comprise all aspects of photogrammetry, remote sensing, image understanding and their connection to computer vision and GIS. His has authored or co-authored more than 300 scientific papers, more than 70 of which appeared in peer-reviewed international journals. He is the recipient of the 1992 Otto von Gruber Award, the 2012 Fred Doyle Award, both from the International Society of Photogrammetry and Remote Sensing (ISPRS), and the 2013 Photogrammetric (Fairchild) Award from ASPRS. From 2004 to 2009, he served as vice president of EuroSDR (European Spatial Data Research, formerly known as OEEPE). From 2011-2014 he was chair of the German Geodetic Commission (DGK), from 2012-2016 ISPRS Secretary General. Currently he serves as ISPRS President. Dr. Songnian Li is Professor and Associate Chair for Graduate Studies in the Department of Civil Engineering at Ryerson University in Toronto, Canada. He received his B.Eng. degree (1983) in Surveying Engineering from Wuhan Technical University of Surveying and Mapping, China and his Ph.D. (2002) in Geodesy and Geomatics Engineering from the University of New Brunswick, Canada. After joining Ryerson University in 2001, he has undertaken teaching and research in the areas of geographical information sciences and GIS systems and applications, and has published over 100 scientific papers. Songnian has been involved in the International Society for Photogrammetry and Remote Sensing (ISPRS) since 2004 as the Chair of ISPRS Working Group IV/5 on “Web-based Add to dictionary Services and Applications” (2004-2012), the President of ISPRS Technical Commission II (2012-2016) and currently the Treasurer (council member). As a member of the Canadian Institute of Geomatics (CIG), he has served the Institute in a number of capacities including Associate Editor of Geomatica, Treasure and Interim Chair of the Toronto Branch, Chair of the Canadian National Committee for ISPRS, and council member. Dr. Mazlan Othman was educated in Malaysia and studied Physics at the University of Otago, New Zealand. On returning to Malaysia in 1981, she pioneered an academic programme on astrophysics at the National University of Malaysia and was appointed Professor of Astrophysics in 1994. She was seconded to the Prime Minister's Department in 1990 to direct the establishment of the National Planetarium, under the Space Science Studies Division. As its Director-General, she also led the design and manufacture of Malaysia's first remote-sensing satellite, TiungSAT-1, launched in 2000. In 1999, she was appointed Director of the United Nations Office for Outer Space Affairs (UNOOSA) and, in 2002, returned to Malaysia to set up the National Space Agency. As Director-General, she established the National Space Centre which houses TT&C, AIT, calibration and research facilities; founded the Langkawi National Observatory; and initiated the programme which placed the world's first remote-sensing satellite in the near-Equatorial orbit. She spearheaded the Angkasawan Programme which saw the launch of the first Malaysian astronaut to the International Space Station in 2007. That year, she resumed the post of Director of UNOOSA. In 2009, she was appointed Deputy Director-General of the United Nations Office at Vienna (UNOV). She is a fellow of several professional bodies and is the recipient of several national and international awards. Dr. Shailesh Nayak is currently the Director, National Institute of Advanced Studies, Bengaluru. He obtained his PhD degree in Geology from the M.S University of Baroda in 1980. He was 'Distinguished Scientist' during 2015-18, Secretary, Ministry of Earth Sciences, during August 2007-2015 and provided leadership for programs related to earth system sciences. His current research interest includes building strategy for blue economy and sustainable development. He set up the state-of-the-art tsunami warning system for the Indian Ocean in 2007 and provided tsunami advisories to the Indian Ocean rim countries. He has pioneered the development of algorithms and methodologies for the application of remote sensing to the coastal and marine environment, and generated the baseline database of the Indian coast, and developed services for fishery and ocean state forecast. This coastal database has formed basis for managing the Indian coast. He was instrumental in creating database of the glaciers of the Indian Himalaya. 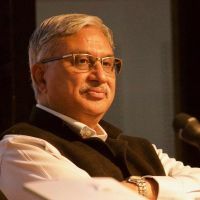 He is Fellow of the Indian Academy of Sciences, Bengaluru, the National Academy of Sciences, India, Allahabad, Fellow of the International Society of Photogrammetry & Remote Sensing (ISPRS) and Academician of the International Academy of Astronautics (IAA). Currently, he is Regional Representative, Asia for ISPRS, Chancellor, TERI School of Advanced Studies, New Delhi and President, Federation of Indian Geoscientists Association. He was President, ISPRS Technical Commission IV on Geodata and Digital Mapping during 2004-2008 and President, International Geological Congress during 2015-17. He was conferred the prestigious ISC Vikram Sarabhai Memorial Award 2012 as well as Bhaskara Award for 2009, for his outstanding contributions in remote sensing and GIS. He has published about 150 papers in peer-reviewed journals.